Mack and I were very fortunate to be able to spend Food Day Canada in early August with Karen Anderson. Karen is a culinary ambassador based in Calgary, well-known for her food writing and tours of markets and dining districts in our neighbour to the south. However, in the last year, she expanded her Calgary Food Tours business to encompass Edmonton and Canmore as well, rebranding as Alberta Food Tours. 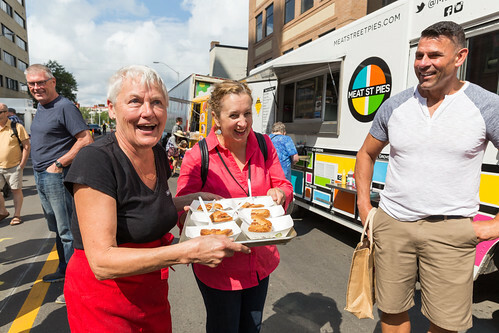 In Edmonton, they presently offer three types of tours: Strathcona Feast centres on the Old Strathcona Farmers’ Market and adjacent area; 104 Street Feast winds its way through the City Market; and the newest Downtown Delights tour exposes diners to old and new gems in the core. 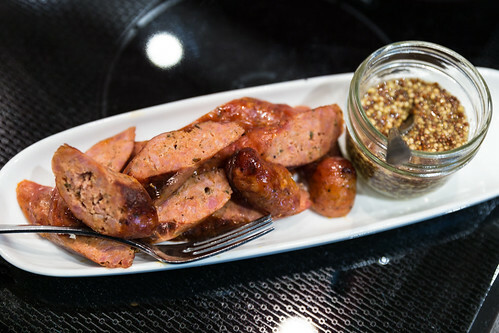 Karen engaged several well-known food personalities to lead the local tours, including Edmonton Journal writer Liane Faulder and chef Cindy Lazarenko. But on occasion, Karen leads the groups herself, which is how we came to meet her in August. Karen had invited us to attend one tour of our choosing; although Mack and I are weekly patrons of the City Market (and residents of 104 Street), we selected the 104 Street Feast option because we wanted to see how Edmonton Food Tours would highlight something so close to home for us (for the record, Get Cooking also offers a City Market tour, followed by a cooking class). 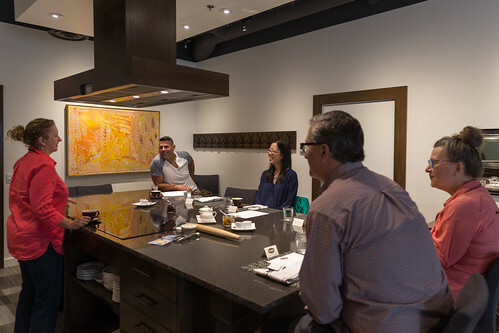 All Edmonton Food Tours are $115 per person, and cover all of the food and drink samples over the course of three hours. We learned later that Karen prides herself on compensating the restaurants and producers she has partnered with. 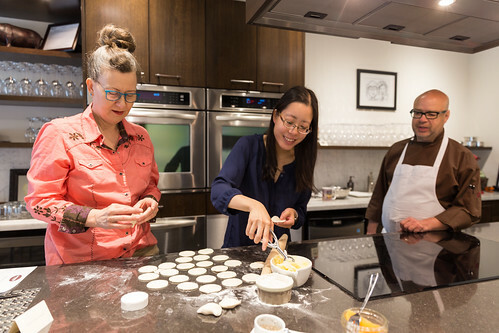 In total, Alberta Food Tours supports over 70 producers in the province. 104 Street Feast begins at Kitchen, Chef Brad Smoliak’s culinary studio. 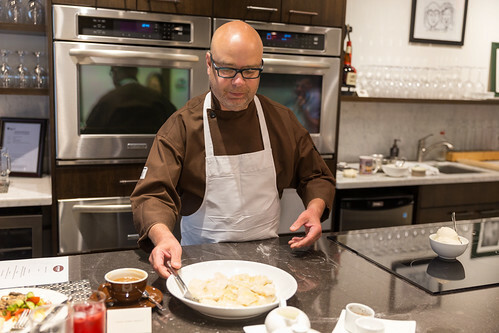 Home to cooking classes and wine dinners, the space is warm and inviting, and Brad made us feel right at home. The small group gathered around the large island for coffee and an introduction of what to expect that morning. We started off with a hearty Ukrainian brunch that we would contribute to. Brad gave us a quick tutorial on how to assemble perogies before setting us loose. He’d prepared a basic dough (a simple and ingenious 2:1 ratio of flour to Dairyland sour cream, mixed together with a dough hook) and a filling of potatoes and Winding Road cheese for us to use. Since his philosophy at the studio is to get people back into the kitchen, Brad recommends having a perogy party to socialize while making up enough batches to go around. This was the highlight of the day for me – it was my first time making perogies “from scratch”, and it is something I could definitely see myself doing in the future. After that, the dishes just kept on coming from the kitchen. Served family-style, this was a unique brunch that I couldn’t imagine being offered anywhere else. Although all of us had big appetites, we barely made a dent in the food. The meal highlighted ingredients sourced from the City Market. 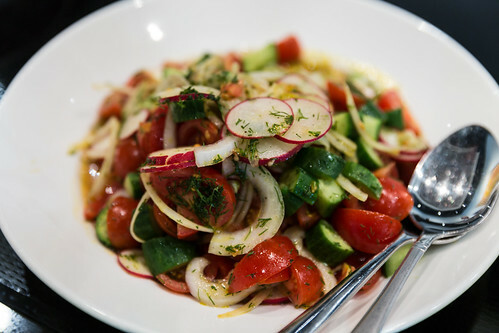 There was a simple and fresh salad of tomatoes, cucumbers, and radishes dressed with cold pressed canola oil that helped cut through the richness of some of the other dishes (I especially loved the flecks of dill). 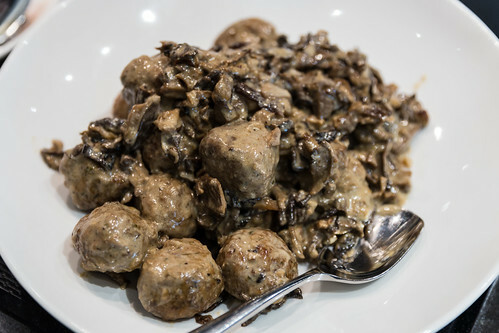 Meatballs, made with Acme ground beef and Irvings Farm Fresh pork, were simmered in a rich mushroom gravy, while Brad’s house-made kielbasa was accompanied by local Brassica Mustard. 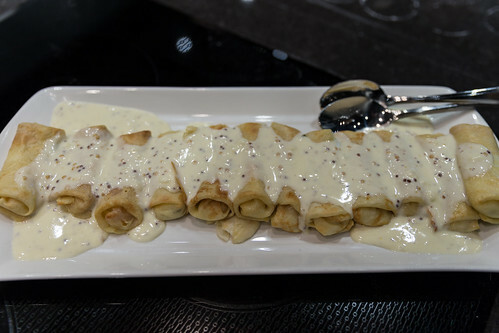 The nalsknky were easily my favourite, a house-made buttermilk cheese rolled in a crepe then doused in a mustard cream sauce. The perogies held up well, considering the inexperienced hands that had created them, and were served in Mack’s preferred way – with onions and lots of butter. Satisfied and eager to stretch our legs, the group wandered over to the City Market to commence the tour. In all, we would stop at ten different vendors or shops. At each vendor, Karen would provide some background about the business, then for most, we were offered a taste of a product or a sample to take home. 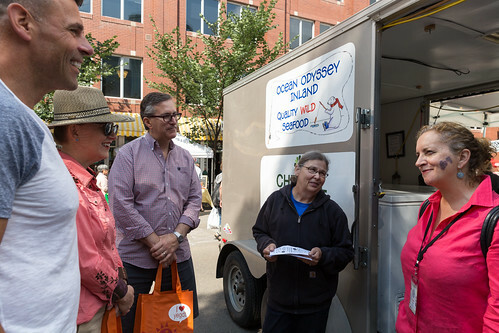 Given the market was in full swing with other customers to serve, it wasn’t possible for each vendor to tell their own story, but I did appreciate when this was possible. 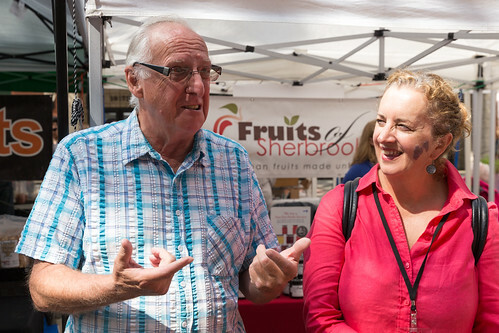 For instance, Alan Cosh, one of the founders of the Fruits of Sherbrooke, shared with us the evolution of the non-profit that began in order to reduce food waste. They began with the production of applesauce, then pies, but finally found their form in jams. Today, they make 45 different varieties (including their bestseller, a chipotle rhubarb ketchup), and having finally broken even two years ago, is now making fruit snacks and applesauce tubes for inner city schools. We also had the opportunity to chat with Ian Treuer of Winding Road Cheese. Based in Smoky Lake, Winding Road is unique because of their use of a plant-based thistle rennet (as opposed to the more common animal-based rennet). 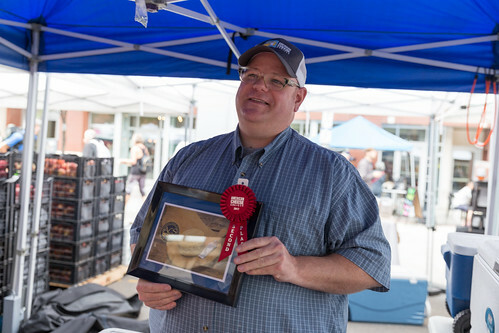 Ian was also fresh from a second place award at the American Cheese Society Conference for his washed rind RDB cheese, which is quite the coup for a cheesemaker who stared as a hobbyist just a few years ago. Winding Road currently offers seven different types of cheese, ranging from the stronger Highland Hall, a soft bloomy rind cheese, to a mild German butter cheese. Mack, upon sampling the award-winning RDB, actually stopped in his tracks to appreciate its flavour. The entire tour took place at a relaxed pace, and we never felt rushed to move on. The three hour length was reasonable, and would allow guests to continue to browse the market afterwards on their own if they chose to do so. 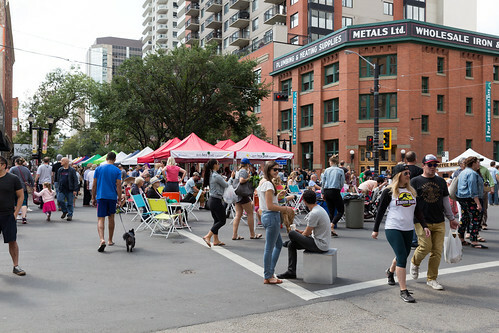 As a whole, the 104 Street Feast is a good resource for locals hoping to learn more about the market, as stories and firsthand connections to producers can be very powerful, but I did think the selection of vendors leaned more towards prepared products. It’s my bias as the City Market provides the foundation of our weekly groceries, so I would have liked to see more farmers included apart from Gull Valley and Reclaim Farm. A meat or egg producer would have rounded things out nicely, and might provide locals with a reason to return to the market on a more frequent basis. Still, the fact that not one, but two tours centre around the City Market is encouraging. 104 Street Feast definitely sets itself apart with the decadent Ukrainian brunch, perogy lesson, and the opportunity to hear from producers firsthand. If you’re hoping to learn more about one of Edmonton’s food institutions, I’d encourage you to consider joining this tour. Edmonton Food Tours’ 104 Street Feast continues weekly every Saturday until October 7, 2017.